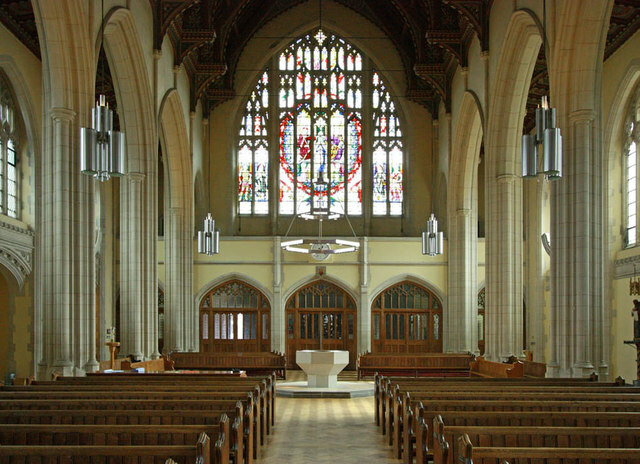 Ealing Abbey Church is a beautiful and functional home for the people and liturgy of the local Catholic community in Ealing. We are working hard to make the church more beautiful as we work to finish the Abbey buildings. Decent replacements for the carpeting around the principal altar and the tabernacle have been completed (March 2014). The next project is to replace the old sound system. Later, some corbelling (stonework finishing) in the Blessed Sacrament chapel is another of our immediate plans. We have ideas in the community for making the church even more worthy of the worship of God. With your help we want to look forward together to the consecration of the church building in the next few years. Sir William Whitfield – 1997, who designed the choir, new chapel, baptistery and sacristy. The Baptismal font and the Icon of the Baptism of Christ by Steven Nemethy (d 2005) on the adjacent wall.